Hundreds of pigs have been released into the New Forest at the start of the pannage season. The animals are deployed to eat acorns and other nuts which can be poisonous to horses and cattle. Drivers are being urged to watch out for them, and the public is asked not to approach or feed them. They'll roam the forest until November 11th. A man who died in a collision in the New Forest has been named as 72 year old David Beresford. 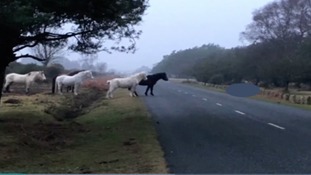 The owner of a pony who died after being hit by a car in the New Forest is urging drivers to slow down. Many homes and businesses are without gas supply in the New Forest village of Brockenhurst for a second day following a flooded gas main. Specialists are checking trees, which are more than 100 years old, on a New Forest golf course after a man was crushed by one yesterday in strong winds. The gardener was on a ride-on-lawnmower at the time and is suffering from potentially life-threatening injuries. It happened at Dibden Golf Centre near Southampton. The man, who is in his 40s, remains in hospital tonight. Buddy, a five-year-old Collie, ran away after being spooked by fireworks. It took one week, a social media appeal and searches involving dozens of people for it to pay off for one family who lost their much loved dog. He disappeared into the New Forest miles away from home. His owners Steve Olsen and daughter Stacey Page tell us their story. A landslide has happened overnight at Barton on Sea in the New Forest. Debris from cliff tops fell onto the beach below. There are no reports of any injuries, but the district council's coastal team has closed the area and put up warning signs at access points and on the beach below. The beach will remain closed off until the cliff stabilises. "The warning now from our coastal scientists, who have assessed the cliff there last night and this morning, is that the area is highly likely to see more significant movement and another landslip. We strongly advise that the area of the cliff top and the beach below should not be accessed by the public." A healthcare worker's mission to give winter survival baskets to elderly people in the New Forest has taken off. Work will start in December on the first phase of construction for the planned £7m Ringwood Arts Centre.